Maryam Mirzakhani, an Iranian-born mathematician who was the first woman to win the coveted Fields Medal, died Saturday in a US hospital after a battle with cancer. She was 40. Mirzakhani's friend Firouz Naderi, a former director of Solar Systems Exploration at NASA, announced her death on Instagram. "A light was turned off today. It breaks my heart ..... gone far too soon," he wrote, later adding: "A genius? Yes. But also a daughter, a mother and a wife." Mirzakhani, a professor at Stanford University in California, died after the cancer she had been battling for four years spread to her bone marrow, Iranian media said. In 2014 Mirzakhani won the Fields Medal, the equivalent of the Nobel Prize for Mathematics, which is awarded by the International Congress of Mathematicians. The award recognized her sophisticated and original contributions to the fields of geometry and dynamical systems, particularly in understanding the symmetry of curved surfaces such as spheres. Born in 1977 and raised in Tehran, Mirzakhani initially dreamed of becoming a writer, but by the time she started high school and showed an affinity for solving math problems she shifted her sights. "It is fun—it's like solving a puzzle or connecting the dots in a detective case," she said when she won the Fields Medal. "I felt that this was something I could do, and I wanted to pursue this path." Mirzakhani said she enjoyed pure mathematics because of the elegance and longevity of the questions she studies. "It is like being lost in a jungle and trying to use all the knowledge that you can gather to come up with some new tricks, and with some luck you might find a way out," she added. In 2008 she became a professor of mathematics at Stanford. She is survived by her husband, Stanford mathematician Jan Vondrak, and her young daughter Anahita. 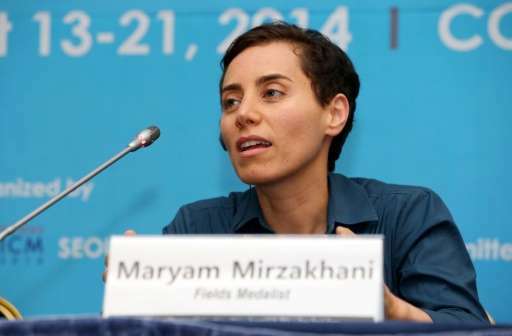 In Iran, President Hassan Rouhani said that Mirzakhani's "doleful passing" has caused "great sorrow," state media reported. Rouhani praised the "unprecedented brilliance of this creative scientist and modest human being, who made Iran's name resonate in the world's scientific forums, (and) was a turning point in showing the great will of Iranian women and young people on the path towards reaching the peaks of glory ... in various international arenas." Separately on Instagram, Iranian Foreign Minister Mohammad Javad Zarif said that Mirzakhani's death is a cause for grief for all Iranians. Mirzakhani's impact "will live on for the thousands of women she inspired to pursue math and science," said Stanford President Marc Tessier-Lavigne. He described her as "a humble person who accepted honors only with the hope that it might encourage others to follow her path." The university said via Stanford News that Mirzakhani's preferred method of working "was to doodle on large sheets of white paper, scribbling formulas on the periphery of her drawings. Her young daughter described her mother at work as 'painting.'" Mirzakhani became known on the international mathematics scene as a teenager, winning gold medals at both the 1994 and 1995 International Math Olympiads—and finished with a perfect score in the latter competition. She went on to win the 2009 Blumenthal Award for the Advancement of Research in Pure Mathematics, and the 2013 Satter Prize of the American Mathematical Society. Mirzakhani studied mathematics at Sharif University in Iran and earned a PhD degree from Harvard in 2004. She then taught at Princeton University before moving to Stanford in 2008. The Fields Medal, which she won in 2014, is given out every four years, often to multiple winners aged 40 or younger. Mirzakhani also collaborated with Alex Eskin, a University of Chicago mathematician "to take on another of the most-vexing problems in the field: the trajectory of a billiards ball around a polygonal table," Stanford News said. "The challenge began as a thought exercise among physicists a century ago and had yet to be solved." The duo published a 200-page long paper on the subject in 2014 hailed as "the beginning of a new era" in mathematics, according to Stanford News. Why is "genius" in quotes? If you won the frigging Fields medal there's shouldn't be any quotes required. So "Iranian-born" is the new polite trend for saying "only born in Iran, but become good in USA". If the news is about a "bad person", the person is probably named as "USA-resident" in news. Thank you for teaching us such deep concepts we simply forget to think about.